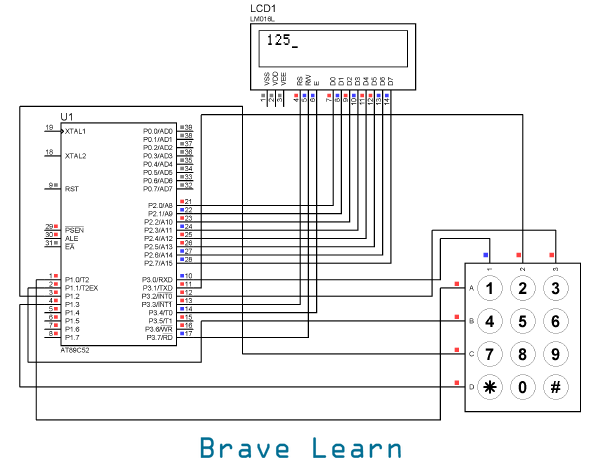 If you want to know how to interface LCD with 8051 Please visit here. 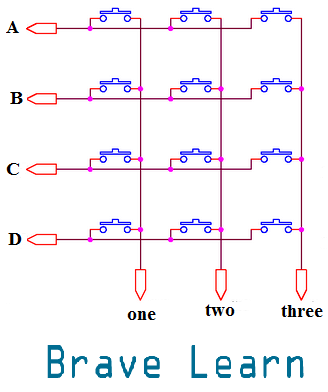 These switch matrix is a combination of switches in rows and columns. We will put all rows on a digital HIGH. As the button 3 is pressed the third column will be on digital LOW. Now we use such a logic to scan each row again. As button 3 is on the first row, it will short the first row to digital LOW. Now Microcontroller detects that row A and the third column are on digital LOW. So, now AT89C51 knows that you have pressed the button 3. It will store this value in an arbitrary variable and displays the value on LCD. to use in a security system like entering a password and opening a door. to save a variable value and much more. Code that is used to interface this keypad and LCD with AT89C51 is given below both in C and Assembly language. Please burn the code using appropriate burner like G540 etc. To know how to burn code with G540 please visit here. void delay(unsigned int time)    //Function to provide time delay in msec.